SCENE 26. Grogan, the only friend Barry has in the world, is shot, and Barry carries him off the field. After a scene of tremendous violence, love again asserts itself into the narrative as Grogan and Barry confess their (manly, countryman) love for one another, complete with a kiss on the lips. But not before Grogan confesses that he’s lost half of Barrys two hundred pounds gambling, which inserts a note of a small loss of social status into the scene, so that all three themes are present. 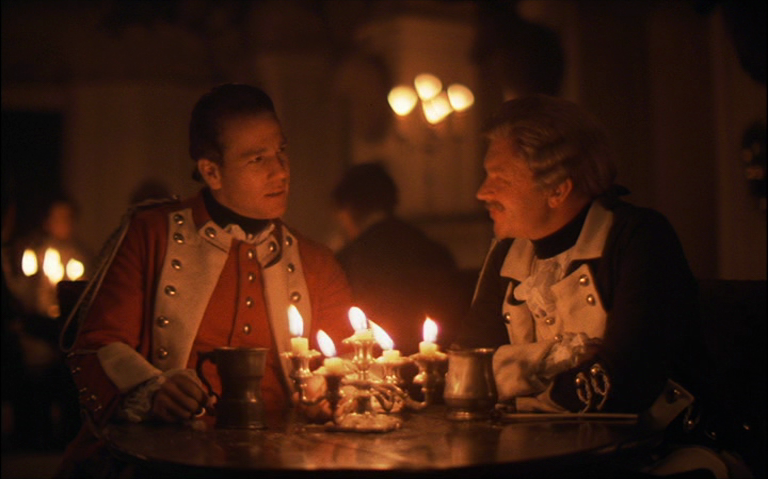 (I’m tempted to add a theme of “chance,” because of the gambling, but gambling, as presented in Barry Lyndon, is never a game of chance. Or, rather, the gamblers of Barry Lyndon, we could say, “play God,” making their victims believe that chance is in play when their loss was guaranteed from the beginning. SCENE 27. 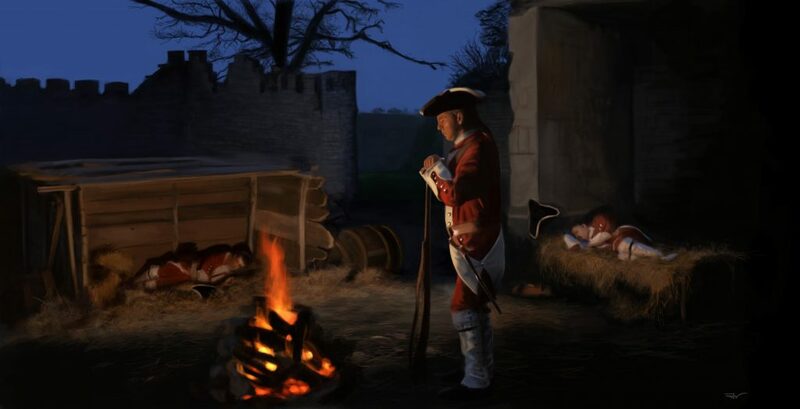 After the loss of his friend and after witnessing the carnage of battle, Barry stands watch over a fire and thinks about how to get out of the army. Despite the opportunity for riches and social status that the army promises, Barry has learned that the pension, and the status, are illusory. Grogan, after all, was a captain, and not only did he get killed but he lost half his money gambling. While Barry has no lines in this scene, he’s beginning to realize that there are forces beyond his control that shape the contours of people’s lives, and if he wants to get out of this thing alive he’s going to have to cheat. SCENE 28. Barry’s army loots a farm, steals its livestock and burns down its buildings. Kubrick doesn’t show us the violence of the army’s attack on the farm, only its aftermath, the farmhouse burning furiously as the army plods away from it, in ranks, leading cows and carrying bushels of produce. 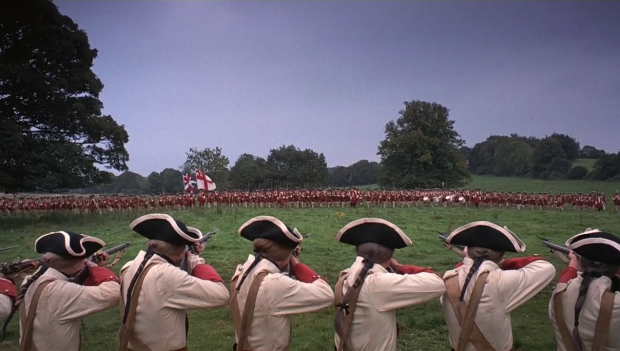 Again, the violence is present, but Kubrick finds a way to show it from a distance. The narrator informs us, for the second time, that armies in the Seven Years War were not made up of noblemen but of ruffians and reprobates. Great kings make plans, but thieves and brutes carry out those plans. Barry himself carries a lamb, perhaps identifying with it, himself a potential lamb to the slaughter. SCENE 29. Looking for a way out of the army, Barry happens upon an unexpected opportunity. What does Barry want? Love, and social mobility. How does he get out of the army? He happens across, yes, a love scene, between two British officers, who are bathing in a lake and having a lovers’ quarrel. It’s the lovers’ quarrel that lifts the plot point out of coincidence and into the realm of thematic unity. Barry, seeing an opportunity for both his current predicament (getting out of the army) and his overarching predicament (raising his social status) steals one of the officers’ horse, uniform and papers. (Kubrick, again, doesn’t show the theft, only Barry thinking about it and then the aftermath. On the one hand, that’s just cinematic storytelling, on the other hand, it cuts out the most interesting narrative aspect of the sequence. There could have been great tension, suspense and humor seeing Barry steal the officer’s horse, to say nothing of his uniform, and getting away through the woods. Kubrick, ever chilly, dispenses with the action beat. SCENE 30. With a triumphal fanfare, Barry is shown riding down a country road, in his new uniform, on his new horse, carrying his new identity. Social advancement, the narrative says, is based on fraud, theft and violence. To get ahead, one must lie, cheat and steal. Barry is high up on his horse as he passes by a platoon of Prussian soldiers resting by the roadside. He’s gone, in the space of a cut, from being one of the poor bastards by the road to being one of the princes of the upper class. SCENE 31. 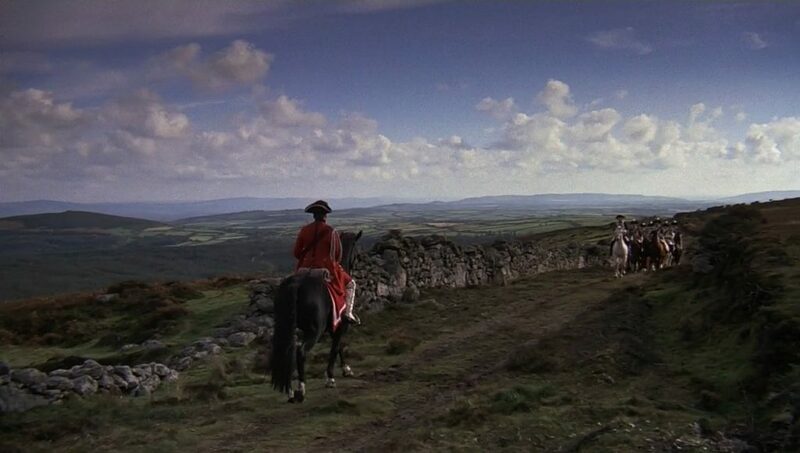 A brief scene of Barry riding his horse toward a town somewhere in the German countryside, as the narrator explains that Barry’s plan is to head to Holland, and then, perhaps, back to England. Riding in style in stolen clothes, “Barry felt, once again, in his proper sphere,” the narrator tells us. And yet, what is Barry’s proper sphere? He was a member of the gentry in his home town in Ireland, but he wasn’t wealthy, and he wasn’t considered a gentleman. The narrator would like us to think that the movie has been saying all along that Barry has desired to be a gentleman, but that’s not exactly true — he was a penniless boy to Nora, and a two-fisted brawler in the British army. He had one brief shot at the beginning of the act where he had 20 pounds in his pocket and no responsibilities, but that moment was immediately punctured like a balloon by Captain Feeny and his son. When the narrator tells us that Barry is “destined to be a wanderer,” perhaps this is what he’s talking about: that Barry is most “in his element” when he’s fleeing places, in those moments between escaping his fate and developing new responsibilities. SCENE 33. Barry dines with Lischen at her house, with her baby on her knee. (Great, great baby acting in this scene, by the way.) Barry, again in the space of a cut, has, with his fraudulent new identity, found love, a home and an instant family. Barry tells Lischen that his name is Lt. Jonathan Fakenham, which is the 18th-century equivalent of introducing yourself as Captain Fakey McFakename, but Lischen, not speaking English well, doesn’t pick up on the joke. SCENE 35. After a brief shot of a cowherd walking one of his charges down a road to indicate the passing of time, Barry says good-bye to Lischen as he continues toward Holland. Lischen calls him “Redmond,” so apparently at some point Barry told her his true identity (or else it’s a continuity error). The tenderness between Barry and Lischen in their three scenes together is palpable, some of the truest emotion expressed in the movie, and so the narrator takes pains to explain, as Barry rides off, that Lischen has had plenty of temporary lovers before Barry ever came along, undercutting the tenderness and adding a layer of cynicism. Love, the narrator suggests, can be just another form of lying. This is going to turn out to be important to Barry later on. For now, Barry and Lischen played house and pretended to love each other, but the next time Barry pretends to love someone, he will have much more sinister motive. SCENE 36. 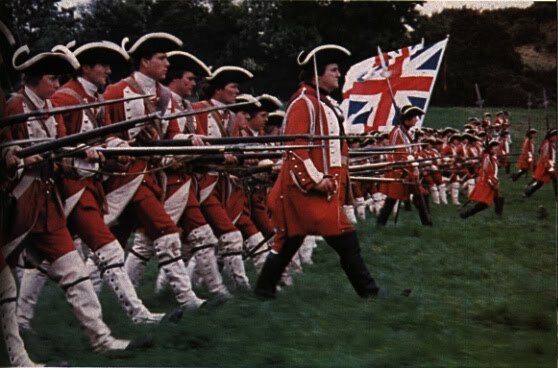 Barry takes off again, the triumphal flourish plays, indicating that Barry, once again, has escaped responsibility and is free, temporarily, on his own, and the narrator informs us, for a third time, that the armies of the Seven Years’ War were made up of criminals and thugs. This time, we’re told that armies resorted to kidnapping to fill their ranks. That is to say, the seduction of the recruitment scene at the top of the act has now given way to the morning after, as it were, as we discover the truth about service in the army. They promise they will love you, but in the end they only screw you. 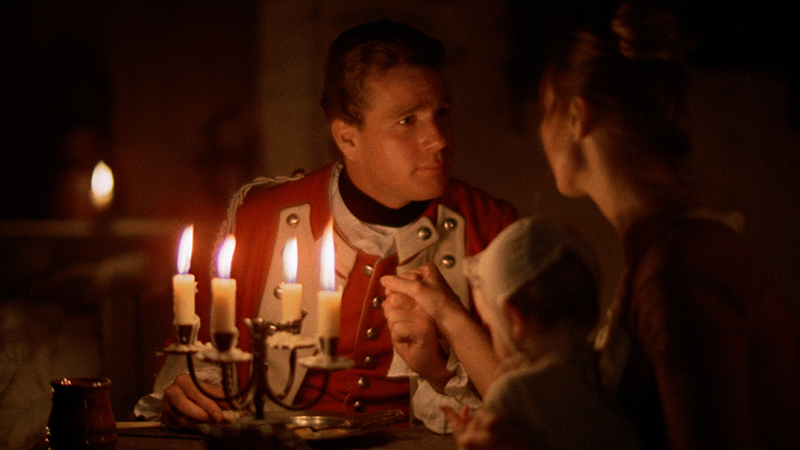 If Barry Lyndon is about violence (and most of Kubrick’s movies are), it employs the same strategies in its script as it does in its shots: the slow zoom. We see everything from Barry punching a guy to regain his honor, to troops being mowed down for a piece of land that matters to no one, to the wealth of great families that is defended by those helpless troops. The world, says the movie, is an incredibly violent place, and the best thing anyone can do for themselves is position themselves in one of the wealthy families that armies die for in the mud of foreign fields. SCENE 37. And again, Barry’s sense of self-worth — his delusion of self-worth, we could say — is immediately punctured by the arrival of Captain Potzdorf, of the Prussian army, who immediately suspects Barry of being an imposter. I’ve often wondered, what makes Potzdorf such a keen judge of Barry’s identity? He’s got all the accoutrements of an officer and a gentleman, but Potzdorf sees through him seemingly at 100 yards distance. The most obvious theory, of course, is that Potzdorf truly is a man of class and social standing, and so therefore can easily spot a pretender. Or, who knows, perhaps Potzdorf is, himself, low-born, and had to claw up the ladder of success to get where he is, and sees something of himself in Barry. Again, both Potzdorf and Barry use pretty language to paper over what’s happening in the scene: Potzdorf is accusing Barry of being a deserter, and Barry is desperately trying to get back to his “proper sphere” (that is, fleeing, alone). But because Barry is still young and Potzdorf has an eye for fraud, Barry, again, bungles an opportunity to play his hand. Instead of finding a gambit to get away from Potzdorf, he doubles down on his lies and ends up heading back to Potzdorf’s camp. SCENE 38. 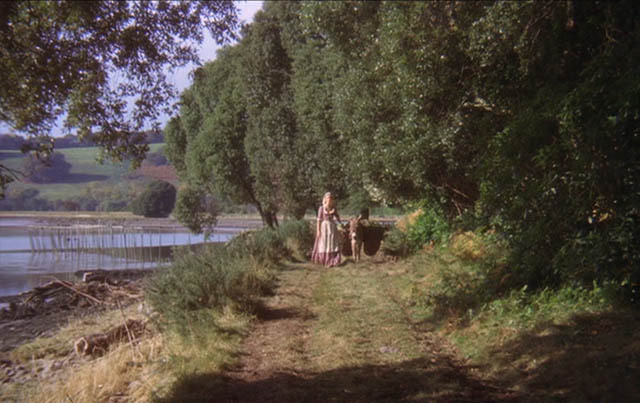 Barry arrives at the castle where Potzdorf and his men are stationed. The narrator informs us that Barry has spent the day boasting of all the fine people he knows in the courts of Europe. 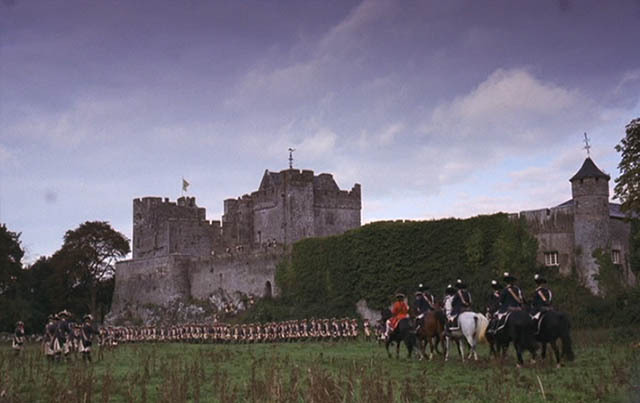 Again, Kubrick doesn’t show what might have been a suspenseful or comic scene of Barry’s deception, but instead shows us the army arriving at a castle while the narrator fills us in. This is exactly what they tell you to not do in film school, that narrators are bad and the object of a cinematic narrative is to show, not tell, but Kubrick has already shown us one scene of Barry trying to put one over on Potzdorf, and will show us the tail end of his long day of boasting. What Kubrick does is cut out the fat. He’s already shown us that Barry is in over his head and that Potzdorf is onto him, he spares us Barry digging himself deeper and cuts into the next scene as late as possible. Meanwhile, he shows the army filing into the castle, one of many similar shots, to, again, keep zooming from the particular to the general, to give us the big picture (armies fighting for kings in their castles) and then the small picture (Barry fighting for his life). SCENE 39. Barry, at the end of his day with Potzdorf, finally tells one whopper too many and Potzdorf has him arrested. Barry, who’s still quite clueless at this point of the narrative, sputters “But sir, I’m an officer of the British army!” He’s dug himself so deep, and is still so unformed, and uninformed, that, even now, he thinks Potzdorf is as slow on the uptake as he is, that he can use the illusion of social status to get himself out of trouble, to pull himself from the gears of the army, that machine that chews up everything it touches. He, of course, isn’t, and the first thing Potzdorf accuses him of is being a liar, which strikes me as burying the lead somewhat. The important thing is that Barry is an imposter, which is mortifying to a man like Potzdorf, and a deserter, which is something that could get him killed, but Potzdorf, exactly like Nora, is more incensed that Barry is a bad liar. To be a good liar, the message seems to be, is the key to being successful in the world. Two thoughts at this juncture. Though it may be unrecorded, this battle scene hardly seems a “tiny skirmish”. 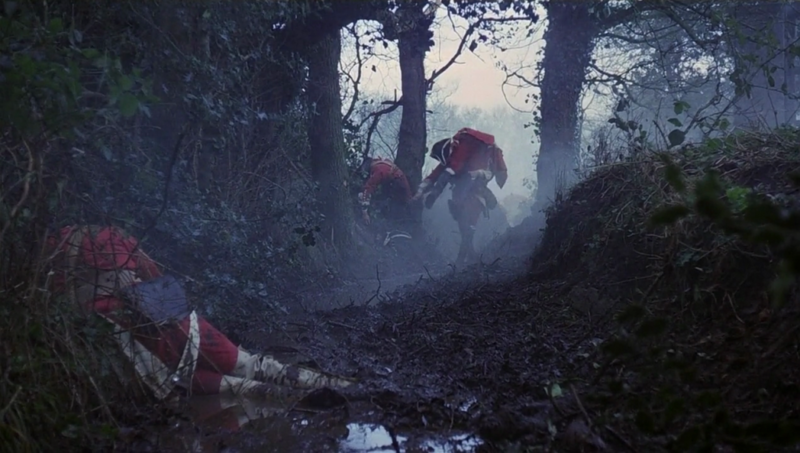 There are apparently hundreds of soldiers involved, and in one easy to overlook shot — as Barry is carrying Grogan off the field of battle into adjacent woods, there are multiple dead already littering the sidelines, and they appear to have been there for quite some time, indicating that there must have been an earlier large “skirmish” on the same battlefield of similar scale. It may be an example (of which there are numerous during the film) of the “unreliable narrator”, an oft-used literary technique (see Wikipedia). 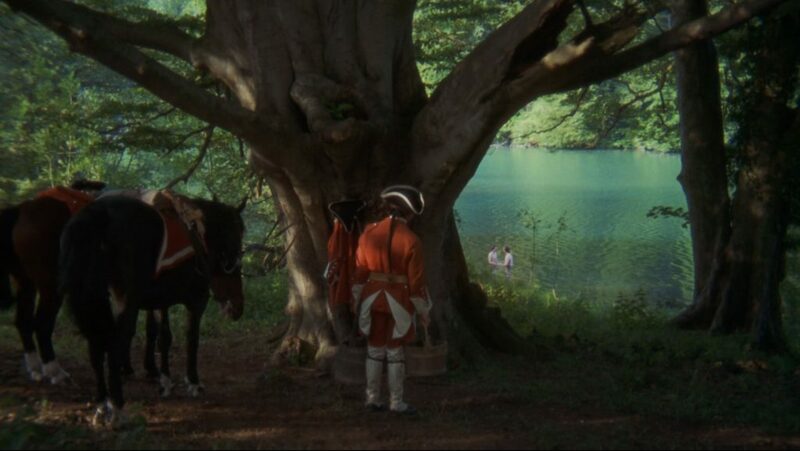 Also, scene 29 with the two officers professing undying affection while waist deep in the lake, is one of many examples in the film of what seems to be a “Water/Love (or Lust)” motif. Scene 3 establishes this connection, with Barry and Nora “finding the ribbon” in the rain, and in scene 33 above with Lischen it is raining. This is a recurring theme throughout. There are innumerable ways to look at Kubrick. I had been wondering earlier why it was raining in the garden-house scene. And why Barry apologizes to Lady Lyndon while she’s taking a bath.